Like that one for the International House of Pancakes, many of the brand and product appearances in The Hangover 2 come, to some degree, at the expense of the brand. P.F. Chang's. Long John Silver's. MSNBC. Teen People Magazine . Fanta soda . Skype . Hard Rock Cafe . Bally Total Fitness . All of these brands are the punchline to varying jokes. Then there are the straight placements, including Delta Airlines , Singha beer , Adidas and Smart Water . 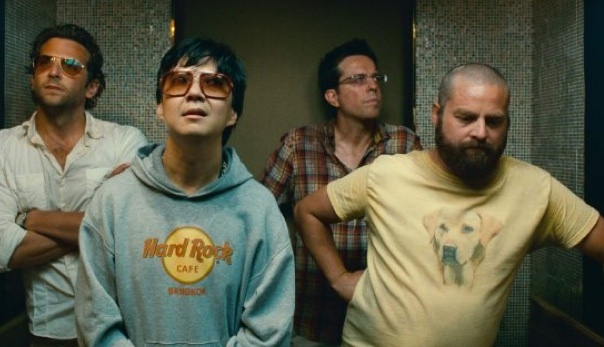 But the most interesting product placements in Hangover 2 are the ones the audience can't see, including where to get Zach Galifianakis' labrador t-shirt. But Ike Behar isn't just a brand looking for a little promotion through a hot Hollywood property. It's a product placement institution of sorts. Ike Behar is to onscreen shirts what Belstaff is to movie jackets and Ray-Ban is to film icon eyewear. On Richard Gere's back in 1984's Cotton Club, Ike Behar has shirted its way through prominent films of the last 20 years, from Donnie Brasco toCarlito's Way to the Miami Vice remake to Ocean's Thirteen to The Sopranos, Gossip Girl andEntourage. Another fashion brand that Hangover 2 audiences will have a hard time identifying is sunglasses-maker Oliver Peoples. Throughout the film, star Bradley Cooper sports the brand's Benedict model. It should't be a surprise to see the Oliver Peoples Benedict in director Todd Phillips' film Hangover 2. Phillips' last film, Due Date, saw Robert Downey Jr. sporting what looks like the same frames. And who is this, but Hangover 2 and Due Date producer and director Todd Phillips, on the set ofDue Date, wearing what look a lot like, yes, Oliver Peoples Benedicts. Another brand that has a brief cameo, but no easy brand identifier, is baby styler Itzy Ritzy. As the brand points out on its website, the "Baby Ritzy Rider in Whale Watching Pink" product is featured in the "f**king IHOP" scene. Itzy Ritzy is taking advantage with a bit of an unofficial tie-in sweepstakes as well and giving away the product seen in the film via parenting blog Babble. Then, there are the local Thai brands. Sirocco, atop the 63rd floor of The Dome at Lebua hotel in Bangkok, is billed as "he world's highest al fresco restaurant." After its scene in the Hangover sequel, it's sure to get a few more visitors. The Lebua is even offering a "Hangover Suite," which includes "spacious 266 square meters of elegant and expansive accommodation" and "Complimentary a fully stocked mini-bar per day." Other local establishments may not have the profile of the Lebua, but that doesn't mean they cannot try and capitalize on the film's success. For example, Bangkok's Bo Sa Bar is identifying itself as "Better known as the White Lion bar in the movie Hangover 2." The White Lion is the bar the gang drunkenly destroys and brings down. Who wouldn't want to have a drink there? Just one drink. Finally, looking for the yellow labrador t-shirt worn by Galifianakis throughout the film? It's called the "Faithful Fried" and it even has its own Facebook page. The shirt is made bya Kansas City artist and you can get it at her website Friskybizphoto.com for $20. Or, it will soon available at an Urban Outfitters near you after the hipster retailer bought 16,000 from the creator, instead of, you know, just stealing the design.